In our efforts to always provide the highest quality and newest services to you, our clients, we would like to announce a new procedure for left displaced abomasum's (left twisted stomach). The Clinic has purchased equipment and trained our vets in the procedure using a camera guided surgery to fix LDAs. This procedure has been used for several years in Europe but only a couple clinics in the US offer the procedure and now Athens Veterinary Service. There are several benefits to this surgery. 1. This surgery is less invasive, needing only 2 small incisions about 1 inch long. This means that the risk of infection is less, requiring fewer antibiotics. 2. Smaller incisions also means smaller amounts of drugs are needed to do the surgery. 3. Cows having this procedure done average a higher intake during the days following surgery, better stomach movement, and faster return to milk yields compared to the routing surgery. 4. The procedure is faster than standard surgery making it easier on the animal as well. 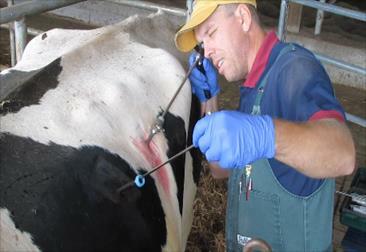 This procedure is a great plus in the ever growing arena of public opinion on humane animal care that is affecting all areas of agriculture. If you have any question, please call the clinic and if you are interested in having this procedure done, please mention this when you call the office as the equipment for this will need to be brought along by the veterinarian.